Many people do pilgrimages to Apple stores when they travel. Others like to go shopping at a famous place. As for me, I tend to have a sixth sense for finding gaming stores, comic stores and official Games Workshop Stores whenever I travel (inside and outside of Spain) and maybe buy a miniature or two to remind me in the future of that trip. 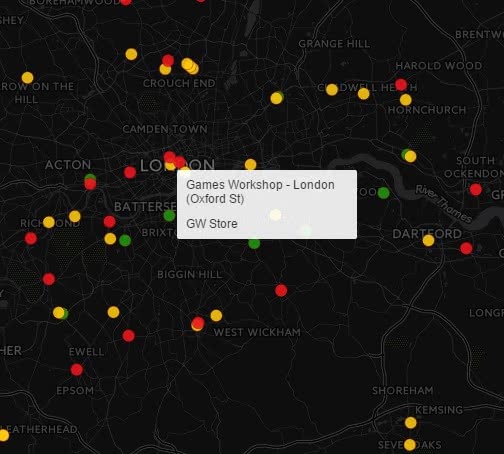 This is more related to chance, so, a few months ago I decided to build a map with the official GW stores and other RPG, boardgames and miniature stores so that if I travel to one of the countries I have data for, I can directly see where I can find stores. It is not full as the data I gathered was mostly from Europe and USA, but I'll probably try to add Asia and Australia whenever I have time, but anyway it can be handy even at current incomplete state. You can check the map here: //theelderthoughts.blogs.kartones.net/page/gw-stores-map. There's a button at the top left area to go fullscreen, and the map works in smartphones and tablets, although instead of moving the mouse over a point to see the name you must click/touch it.